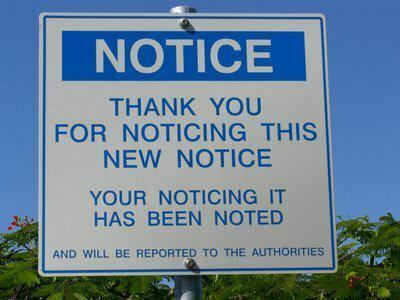 There are some other signs that have made me smile along the way. Sharing them. Sorry I cannot tell you where I got them exactly, but they make me smile at the pure silliness of our life here on Earth. And for me – there is profound statements here…. The best sign of about signs. I was walking through our wooded park in the neighborhood when I walked by road with a sign that said “Speed Bump”. It occurred to me that we all come up against speed-bumps in our lives. It doesn’t mean to stop or back up (I could just imagine all of the cars along the road stopped behind the speed-bump with nowhere to go). It means to slow down, take it easy over the bump, and keep your course ahead but be aware there is something in the road that is going to slow you down. It’s put there for a reason to keep us from going to fast. 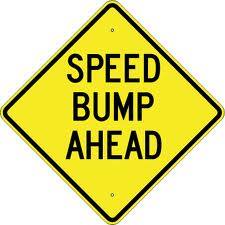 It seems like we all have some speed bumps in our lives. Some of them come up really quickly and we don’t entirely notice the signs. We run into them full speed and it just shakes us very hard. We have to slow down for a bit, compose ourselves and make sure everything is okay. Other times we see the sign, we prepare for the speed bump a head – slow down and watch for it and slowly drive over it. There are going to be bumps in the road, some we see and some we cannot see or others we choose to not see. We have to look for the signs ahead, be thankful that someone put them there to warn us. Some other times so many people have ridden that same road that there are pot-holes that have come with so much traffic, perhaos they are damaged roads and we don’t see them- or we follow others as they speed there way into them. Either way, once you realize that you should expect some pot-holes, some speed bumps, some things that will slow you down; you can keep your eyes wide open. It makes you aware that everything you do (even the little things) can make a difference. Slow down as you look. You can slow down, and recognize the opportunity to move foward (over the bump) and that once yoy get over it you can move on.